The Samsung Galaxy S III makes its U.S. debut today and consumers will be able to purchase the phone in T-Mobile stores or from the company's website. Customers who pre-ordered the phone on Sprint or AT&T should also start getting the devices soon, although both carriers have said that new orders won't ship for about a week or so. Verizon Wireless should begin carrying the phone within the next several weeks, too. As a quick refresher, the Galaxy S III offers an amazing 4.8-inch HD Super AMOLED touchscreen display, a dual-core 1.5GHz Qualcomm Snapdragon S4 processor, 2GB of RAM, a 2,100mAh battery, 16GB/32GB of storage and a microSD card slot for adding up to 64GB of additional storage. 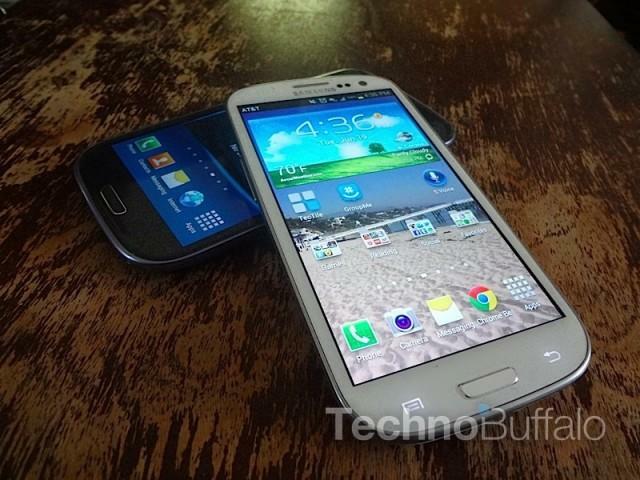 For more information, be sure to check out our reviews of the AT&T and T-Mobile models of the Galaxy S III. We'll be bringing you reviews of Sprint and Verizon's devices as soon as possible. NEW YORK–(BUSINESS WIRE)–The Samsung Galaxy S® III has officially launched in the U.S. The premium content sharing smartphone is available online starting today on T-Mobile's Web site and in select retail stores. AT&T, Sprint, Verizon Wireless and U.S. Cellular will have the Galaxy S III in-store and online within the next several weeks. "Once again, we are putting the 'Next Big Thing' in consumers' hands. The Galaxy S III introduces a completely new way of sharing and socializing that no other mobile phone can"
The Galaxy S III celebration kicked off in New York City last night with a star-studded event hosted by actress Ashley Greene. Five hundred Samsung fans were granted access to an experiential event held at Skylight Studios in the trendy SoHo district to test drive the sharing capabilities of the Galaxy S III, get their picture taken with NBA stars Steve Nash, Kevin Love and Stephen Curry and share those once-in-a-lifetime experiences thanks to the Galaxy S III. Capping the night off was a special surprise performance by Skrillex. Taking its inspiration from nature, Samsung Mobile designed the Galaxy S III features to respond intuitively and naturally to human use and interaction. It balances ergonomics with intuitive use so that the device becomes an extension of the user. To celebrate the launch of the Galaxy S III, Samsung Telecommunications America will donate $1.5 million to benefit the World Wildlife Fund (www.wwf.org), which strives to build a future in which people live in harmony with nature. Samsung fans can share with the world which animal species they love by voting at www.facebook.com/samsungmobileusa and at the various launch events being hosted June 20-22. Samsung will announce the donation on its Facebook page and tap into its community of nearly 7 million fans on Facebook.com/samsungmobileusa to help raise awareness of the WWF initiatives with posts throughout the week. The launch of the Galaxy S III is being supported by the largest and most innovative marketing and advertising campaign ever conducted in the U.S. by Samsung Mobile. The campaign leverages technology to engage consumers in new and interactive ways and reward Galaxy S III owners. With sharing as a key feature of the Galaxy S III, Samsung is rewarding new owners with premium content via Samsung Share-to-Go Stations across the nation at no cost. Leveraging the NFC technology incorporated into the Galaxy S III, Samsung customers are able to download content directly to their device with a simple tap of their phone to the smart board or kiosk. Content is stored on the device so it can be viewed at any time. This summer, Samsung is launching an interactive cinema 3D game experience at theaters across the country. The Samsung Galaxy SIII Cinema Game allows the audience to uniquely interact with a 3D phone on-screen and move the images with hand motions to score points. This weekend, the Times Square Share will give consumers on the streets of New York, the first opportunity to share photos and video with the Galaxy S III. Consumers that perform actions such as playing air guitar or showing off dance moves can watch their video on the Samsung Big Board in Times Square and on Samsung's social media channels. Samsung presents Beacon, a mobile-only magazine and content hub with the latest news, tips, information and entertainment designed for people who've left the desktop behind. Beacon will offer daily news and features curated from more than 1,000 sources across the Web, as well as exclusive stories and downloadable content in the form of music, video, and e-books and magazines. "Once again, we are putting the 'Next Big Thing' in consumers' hands. The Galaxy S III introduces a completely new way of sharing and socializing that no other mobile phone can," said Dale Sohn, president of Samsung Telecommunications. The sharing services and capabilities of the Galaxy S III connect people to the experiences and content that influence their daily lives. This smartphone harnesses the potential of Samsung's diverse ecosystem of consumer electronics by enabling sharing of content with multiple devices, among large groups or with another device. The process of pairing the Galaxy S III for these sharing services takes little to no set up. AllShare Play – Galaxy S III automatically locates Samsung HDTVs, laptops and other devices on the same WiFi network that are ready to receive video files. Users remotely access files from devices on other networks. A host of premium Galaxy S III accessories, including convenient docking options, convergence solutions and an array of colorful cases and covers, will be available for all Galaxy S III smartphones.